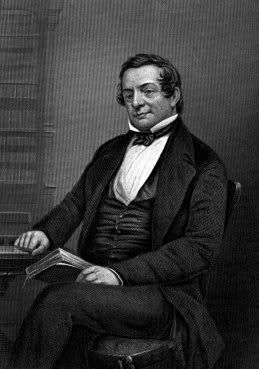 Washington Irving (1783-1859) was one of America's early ambassadors of style and taste. He brought understanding of America to Europe and introduced many Americans to aspects of European culture. He stands today as an important representative of the new nation's artistic creativity at the turn of the nineteenth century. Born in New York City during the last weeks of the American Revolution, this youngest of eight surviving children of Scottish immigrants was named in honor the war's greatest hero, General George Washington. In later years Irving was fond of telling that, as a child, he was introduced to Washington in a New York City shop and received a presidential pat on his then-curly head. Over the course of his long life, Irving had many more occasions to meet famous people. Such literary giants as Sir Walter Scott, Henry Wadsworth Longfellow, and Charles Dickens heaped praise on the first genuinely American author. Such artists as David Wilkie, Gilbert Stuart Newton, and Felix O. C. Darley vied for the chance to capture his visage or his fanciful characters in pencil or on canvas. Traveling widely, Irving befriended people everywhere, from presidents and kings to village neighbors and children, and became one of America's most beloved and respected citizens. Honors bestowed upon him during his lifetime confirm the high regard in which he was held by his contemporaries. He received honorary degrees from Columbia University (A.M. 1821, LL.D.1829), from Harvard University (LL.D.1832), and from Oxford University (D.C.L. 1831). Spain elected Irving to membership in the Real Academia de La Historia (1828), and England's Royal Society of Literature voted him its prized Gold Medal in History (1830). He declined an offer from the Tammany Society to run for Mayor of the City of New York in 1838, but he did serve for ten years as the first president of the Astor Library, forerunner of the New York Public Library. In 1849 the Smithsonian Institution elected Irving an honorary member, one of very few such in the long history of that prestigious organization. Although he trained for the law and tried his hand at the family business, Irving achieved fame as a writer. He gained recognition as a humorist with the publication of Deidrich Knickerbocker's A History of New York, a satirical and still very amusing account of the early Dutch settlers of Manhattan. Irving's fictitious historian, Deidrich Knickerbocker, gained such popularity that the word "Knickerbocker" soon came to mean "New Yorker." Irving was fascinated by Spain, where he spent many years perfecting his command of the language, doing research, and travelling extensively. His experiences there resulted in The Life and Times of Christopher Columbus (1828), the first English biography of the great explorer, and The Alhambra (1832), a fascinating series of sketches based on this medieval fortified palace built by the Moorish ruler of Granada. During the seventeen years Irving spent living and writing in Europe (1815-1832), he served in the diplomatic corps in London as secretary to the American Legation to the Court of St. James, as well as attempting to save his family's export business in Liverpool. When he returned to new York in 1832, he wondered how he might be received by his countrymen after such a long absence. He need not have worried, because New York greeted him with a huge testimonial dinner at which he was the toast of the town. Wishing to get back in touch with his own country, Irving joined a U.S. Army expedition to the West, travelling to what was then the Oklahoma Territory. From this adventure flowed A Tour on the Prairies (1835) in which he described riding after a heard of Buffalo and downing one with a single shot. His friendship with John Jacob Astor led to the publication of Astoria (1836), a history of Astor's fur-trading adventures in the Pacific Northwest. Having lived out of a suitcase for most of his adult life, Washington Irving longed for a place he could truly call home. In 1835 he returned to the area he had made famous in "The Legend of Sleepy Hollow" and purchased a small Dutch farmhouse beside the Hudson River in Tarrytown, New York. The stone cottage, built during the eighteenth century, was a rectangular, box-like structure with a pitched roof. 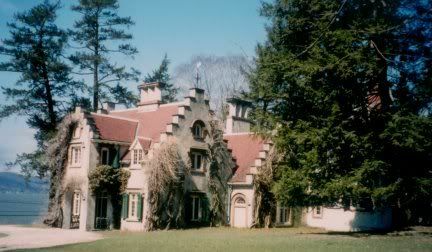 Assisted by his neighbor, landscape painter George Harvey, Irving created a romantic retreat he lovingly called "Sunnyside," adding Dutch stepped gables of the type he had known as boy in Manhattan and weathervanes from old buildings in New York and Albany. Harvey had made a watercolor of the original house in 1835, which he called The Old Cottage Taken Previous to Improvement. In 1837 he did another watercolor, with subsequent lithograph, which he called The Van Tassel House - The Residence of Washington Irving. In it the house has the true romantic look with which it has since been associated. In 1847, ten years after the completion of the first remodeling of Sunnyside, he added a tower that allowed more space. Called the "Pagoda" by his friends, its design source lay in the Spanish monastery towers quite familiar to Irving from his years in Spain. Irving was enticed away from the comforts and delights of his "snuggery" when in 1842 President John Tyler appointed him Envoy Extraordinary and Minister Plenipotentiary to the Court of Queen Isabella II of Spain. He served in this post with distinction for four years, sending entertaining dispatches home to Secretary of State Daniel Webster. The last decade of Washington Irving's life was devoted to what he considered his greatest triumph, a five-volume biography of George Washington. The Life of George Washington (1855-1859) stood well into this century as the definitive work on this nation's first president. Although Irving was a bachelor, he had several relatives living with him and frequent guests kept Sunnyside filled to capacity. His personal and literary popularity drew a steady stream of visitors to Sunnyside, who came just to shake his hand or spend a few minutes in conversation. By the time he died on November 28, 1859, both the man and his house had become national icons. Many who visited Sunnyside wrote their impressions or sketched the property, including Irving's neighbor Evie A. Todd, artist Benson Lossing, and illustrator Felix O.C. Darley. This extremely valuable source material has been used to document room treatment and placement of individual objects within the house, as well as providing guidance for landscape design. The furnishings at Sunnyside most of which are of American manufacture, date from the late eighteenth century to the middle of the nineteenth century. While it is not a house filled with grand and important furnishings, the mixture of objects representing his international travels and his many friendships reflects the genial nature of the man. The landscape remains much as Irving and his guests enjoyed it: rolling lawns, wildflowers gracing the banks of the stream, the pond he created and called his "Little Mediterranean," and the ever present Hudson, flowing swiftly on its way to meet the sea at New York harbor. Sunnyside was the home of collateral Irving descendents well into the twentieth century. In 1945 the property was acquired by the Sealantic Fund, Inc. a private philanthropy established by John D. Rockefeller, Jr., and opened to the public as a historic site in 1947. 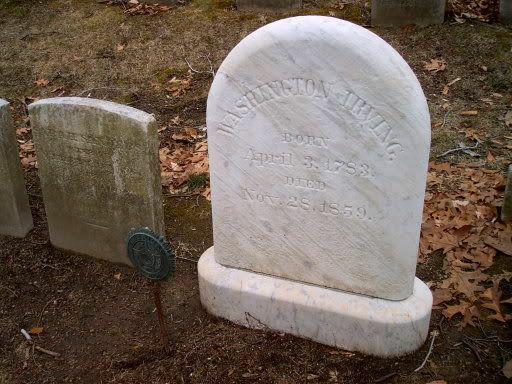 Irving died in Tarrytown on November 28, 1859, and is buried in the Old Dutch Burying Ground in Sleepy Hollow. Just before retiring for the night, the author had said: "Well, I must arrange my pillows for another weary night! If this could only end!" Thanks DITHOT, that was really interesting. I didn't know anything about Washington Irving before. And I just LOVE that house I wanna live there! At least you can visit if you ever make it over! It looks like a beautiful spot! I saw his house several years ago. It was cool. Very interesting, DITHOT. I knew he was respected as a writer, but I had no idea that he had so much influence in other arenas. I also never knew where the NY Knicks got their name. And I'm with Sands - I want to live in that house. It is just charming! I was surprised to learn that he was the first American writer to become famous in Europe. I love that house! Endora they said he worked very hard on the design to get it exactly right and incorporated a lot of details in the architecture down to the weather vanes. I wish I lived closer and could visit. What a beautful place.